I recently had the opportunity to visit two of Hungary’s major wine regions for the first time, spending my first couple of days in Tokaji, the small region that hugs the Ukrainian and Slovakian borders, around three hours drive east from Budapest.Once past the suburbs of the beautiful city of Budapest, conceived on a grand scale as a captial of the Austro-Hungarian Empire, and the drive skirts the Great Hungarian Plain, a flat, almost featureless landscape broken only by small villages and endless fields of sunflowers and sweetcorn. Distant glimpses of the Carpathian mountains offer some relief. Nearing Tokaji, and the vineyards begin, just as the landscape begins to develop more creases and folds. Gently undulating slopes grow steeper and higher as they become the Zemplén hills, culminating in the hill of Tokaji, a volcanic cone that is the region’s highest point, at around 514 metres. 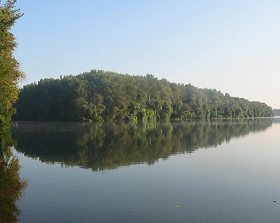 Here in the small town of Tokaji, it is the confluence of two rivers – the Bodrog and the Tisza – that creates the misty conditions essential for formation of Botrytis cinerea, so vital in creating the sweet Tokaji wines that have put the region on the map.But Tokaji makes a range of wines, from bone-dry, through late-harvest, to the extraordinary Esszencia as well as the famous Tokaji Aszú at 3, 4, 5 or 6 Puttonyos. 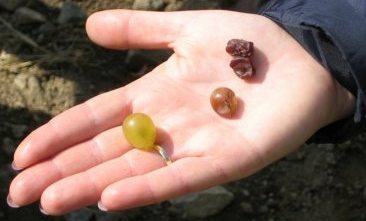 A small group of indigenous grapes is responsible for all styles, the most important by far being Furmint, Hárslevelu and Yellow Muscatel, with Zéta, Kövérszolo and Kabar also in production. My visit to Tokaji coincided with the harvest, which offered a fascinating opportunity to see the way these grapes are used. All three of the Furmint grapes in the photograph were picked from the same bunch: some of the grapes being in perfect, ripe, juicy condition (ideal for dry wines and as a base wine for Aszú), some are partially shrivelled (perfect for semi-sweet ‘Szamorodni’ and late-harvest styles) whilst the fully rotted, Botrytis-affected grapes will end up as Aszú or even the rare Esszencia nectar. My first visit of the trip, to the Disznóko estate, gave me the rare opportunity to taste some fresh Esszencia, straight from the tank, the rarest of all Tokaji wines. Indeed wine is an incorrect description, as this is ‘nectar’, traditionally sold as much for its curative properties as its astonishing flavour. Esszencia is the mollasses-thick, extraordinarily sweet juice that runs from a small vat of fully Botryised grapes, without pressing. It is only marginally alcoholic (somewhere between 0.5% and 6.0% alcohol) with fermentation by ambient yeasts. The precious liquid seeps drip by drip to be collected in demi-johns. Esszencia is composed of around 700g/l of sugar – sometimes up to 900g/l. That means 90% of the liquid is sugar, the remaining 10% being the most intense raisined flavour imaginable. Left: precious Esszencia at Disznóko. The most familiar Tokajis are the Aszú wines, made in a process first recorded in 1630 by Szepsy Laczko. The sweet, three- to six-puttonyos wines are made by adding Botrytis berries to a base wine of healthy, Botrytis-free must. Up to three days of maceration extracts sugars, acidity, aroma and flavour from the aszú (Botrytised) grapes, and then the must is pressed before transferring to oak barrels for several years. The proportion of aszú grapes – measured as ‘Puttonyos’ – determines the sweetness and richness of the finished wine. Disznóko estate sits at the foot of a vine-clad hill, a group of 18th century buildings plus the striking press house and tractor garage, built by prize winning architect Dezso Ekler in 1995.Owned by the French group Axa Millésimes (Pichon-Baron, Suiduiraut, Quinta Do Noval, etc), Disznóko’s vineyards were declared as ‘first class’ in the 1772 classification of Tokaji, but in common with other estates, the period of Communist rule saw a steep decline in quality as production was turned over to making bulk wines, blended from regions across Hungary. Axa Millésimes’ purchase in 1992, after the fall of the old regime, saw the biggest investment ever in Tokaji, with new cellars and extensive replanting of the vineyards. A labyrinthine aging cellar was carved into the solid rock. Similar stories of rehabiliation took place across Tokaji, with Danish and English investment in the Royal Tokaji company, and the Oremus estate being taken over by the owners of Spain’s Vega Sicilia. 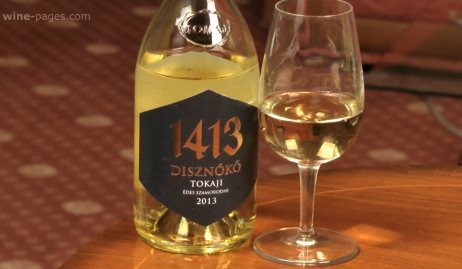 Disznóko’s soils are volcanic, which they believe gives minerality to the wines, with the hill of Tokaji changing more to loess (wind-blown, silty sediment). The most important grape of this estate is Furmint, which accounts for 60% of plantings. 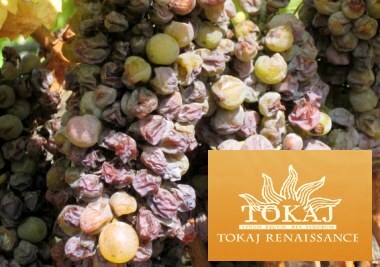 There is around 30% of Hárslevelu (Harsh-La-Velooh) and small quantites of other Tokaji varieties. This is another winery that has seen huge investment since the fall of communism, though this time by the Hungarian Kékessy family. The current generation made their money overseas, but the Kékessy’s have been involved in viticulture in the region since the 18th century and say they have re-built this winery and vineyard “acre by acre and stone by stone.” There is evident attention to detail in vineyard and cellar, with harvesting into small, 15kg plastic bins, and all grapes selected by passing across a vibrating sorting table. In common with most estates I visited, all barrels used are Hungarian – in this case oak from the local forests of the Zemplén hills. The barrels are very similar in size to Bordeaux’s ‘barriques’ at 200 litres (as opposed to 227 litres for Bordeaux) though the barrels are shorter and more squat. 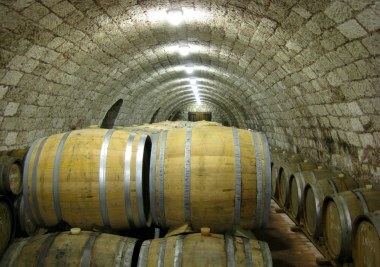 For all Aszú wines fermentation is in barrel, with natural yeast. The fall of the communist regime in 1989 meant state-controlled vineyards once more entered private ownership. By 1995 Tokaji Renaissance had been formed, now an association of 18 wineries whose stated aim is to protect and promote the ‘great growths’ of Tokaji, based on the authenticity of the vineyard terroirs and winemaking traditions. In practical terms this means organising tastings and exhibitions at home and abroad, and members must be estates with a legimitmate historical background as classfied vineyards. The eight or so members of Tokaji Renaissance who assembled showed a range of wines, including dry table wines and sweet, traditional Aszú. But there was also a whole selection of sweet and semi-sweet wines that are breaking the Tokaji mould: traditionally, sweet Tokaji is an oxidised wine style, given long ageing – sometimes up to eight years – in barrel before release. Much like Italian Vin Santo or French Rivesaltes vieux ambrée, Tokaji Aszú wines aren’t necessarily about prisitine freshness, but have a certain rancio character. These ‘new’ Tokajis are mostly made in a much more reductive style (excluding air, and thereby oxidation from the winemaking) and have a much brighter fruit character and cleaner, fresher finish. The Eger region lies mid-way between the capital city of Budapest and the Tokaji region. Eger is both the name of this region and of its provincial capital city. The city is a historically important centre, and a remains a very beautiful one. An 11th century castle, cathedral and various splendid churches combine with an historic ‘old town’ of narrow, winding streets, craft shops and restaurants. 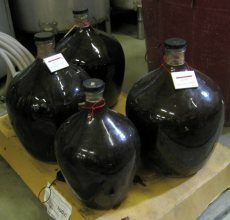 Wine has been made in Eger for over 1,000 years, with some cellars over 400 years old. Indeed the wine cellars of the Eger region are fascinating in their own right, most of them carved from solid ‘Tufa’ rock, with some entire wineries hewn from Tufa cliff faces as a mass of subterranean tunnels and large caverns. 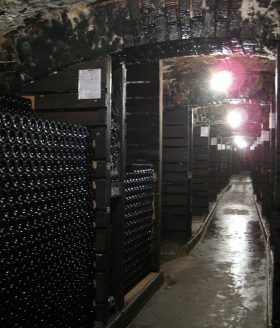 The photograph left is of the Bolyki cellars in Eger. But although based on the tunnels of a 500-year-old quarry, like many other cellars I visited not all of these Troglodyte wine cellars are ancient: Bolyki has recently opened up a whole new chamber filled with stainless steel tanks, and excavating the tufa hillsides with large tunnelling machines is still a common method of constructing cellars that are cool and humid, and perfect for the job of making and maturing wine. Undoubtedly Eger’s most famous wine is Bikavér, or ‘Bull’s Blood’, which takes its name from a 16th century legend: 2,000 Hungarian soldiers withstood a month-long siege of the fortress at Eger by 150,000 invading Turkish troops. As food ran out, wine cellars were opened for the Hungarian troops in the hope that wine would give them strength. On seeing the red wine-stained beards and armour of the troops, word spread amongst the invading Turks that they were drinking the blood of bulls to make them invincible. Soon the siege by the demoralised Turks was broken. Eger is the biggest wine region in Hungary, and of course Bull’s Blood its most popular wine. A lot like Châteauneuf-du-Pape in the Rhône Valley, many grapes are permitted in Bull’s Blood. Eleven varieties can be mixed freely, but regulations state that Bull’s Blood must contain at least three different varieties, and no single variety can account for more than 50% of the blend. Permitted Bull’s Blood grapes include Kékfrankos (synonymous with Austria’s Blaufränkisch), Kadarka, Médoc Noir (Merlot) and Cabernet Sauvignon. These varieties turn up in other Eger red wines, as do Syrah, Cabernet Franc, Portugieser, Zweigelt and Pinot Noir. 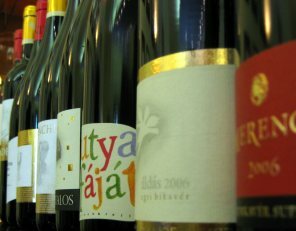 For white wines, the popular Leányka is joined by Grüner Veltliner (known locally as Zöldveltelini), Irsai Oliver, Welschriesling and Tokaji’s Furmint and Hárslevelu, making both sweet and dry styles. Bull’s Blood has both positive and negative connotations for Western wine drinkers. The cheap plonk of many a student party in the 70s and 80s, even that mass-produced stuff had a certain rough and ready appeal. But Eger too has been revitalised under private ownership since communism fell in 1989, and at least some of today’s Bull’s Blood makers are trying to produce something altogether more serious, both as Bull’s Blood and as varietal and other blended wines. These include producers like St Andrea Cellar, amongst whose range (left) is a Bull’s Blood called Merengo, ambitiously pitched as an ‘icon wine’, selling for 40 Euros locally, and being offered ‘en primeur’. 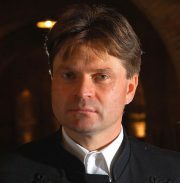 Gyorgy Lorincz is owner and winemaker of one of Eger’s leading estates, St Andreas. Gyorgy had a huge set back in 2005 when his partner in the business and one of Hungary’s brightest stars, Tibor Gál, was killed in a car crash whilst working on a project in South Africa. The success of St Andrea began in 2002, when new cellars were carved into the hillside and extensive new vineyards planting began, with density of vines doubled from a traditional 3,600 plants per hectare to over 6000 plants per hectare. Gyorgy has just planted in a new district which he describes as a “great terroir,” and in all they have 19 different varieties planted from almost 50 permitted in Eger. Whether in his Bikavér or one of numerous other bottlings, Gyorgy says his focus is firmly on indigenous varieties, “Cabernet and Merlot are not so interesting.” He uses only open vats and barrels for fermentation, and only natural ambient yeasts. He employs lots of small plastic bins for fermentation in small batches. Though not yet certified, St Andrea has started to grow grapes organically, and has 16 hectares fully organic and farmed using biodynamic preparations. It is a long, slow learning curve says Gyorgy, as the 2007 harvest was very wet and mildew became too big a problem, so he had to spray with chemicals in the end. “Next year we’ll start again,” he says. Gyorgy also tells me he is abandoning French oak barriques in favour of the traditional Hungarian 300-litre barrels. The wines of St Andrea are excellent by and large, yet strangely and somewhat disappointingly, despite the indigenous grapes, natural yeasts and Hungarian oak, I thought they were some of the most ‘international’ wines of my trip. I only tasted four wines here, but each was very impressive. This is a family winery, where the unassuming János Bolyki tells how he inherited an apartment in Budapest and car from his parents, but decided to sell both to buy a vineyard in Eger, purchasing 11 hectares based around an old quarry. He has since added 14 more hectares, and has even expanded his fascinating winery, built straight into the rock face. The tunnels which are part of the 500-year-old quarry have been expanded, but this most natural and traditional method of cellar construction is not without its dangers: the inset photograph shows the results of a collapse, which destroyed a tank last year – János arrived to find a river of wine running down the hill from his winery. The cellar is filled with stainless steel tanks and barrels, and the winemaking is quite adventurous, including some intense, Botrytised wines that are vinified dry. In 2005 Bolyki invited a local school for children with physical impairments to pick the grapes for a special wine, to be bottled and sold to raise money for their school. The wine is labelled ‘Nem Hall Nem Lát Nem Beszél’ which translates as ‘can’t hear, can’t see, can’t speak’. Tibor Gál is certainly one of the biggest, and most commercially successful names of the Eger region, established in 1993 as a partnership between Tibor Gál, Kobrand of the USA and the Italian family behind Sassicaia. Though initial production was based largely on purchased fruit, they have been planting vineyards extensively since 1997, and today produce 250,000 bottles, only from estate fruit. 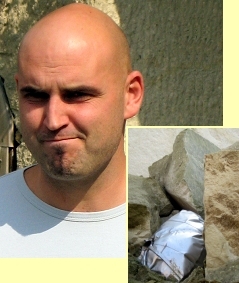 Tragedy struck the estate in 2006 when founder and winemaker Tibor Gál, former winemaker at Ornellaia and one of Hungary’s best winemakers, was killed in a road accident aged 46. Today, his talented son Tibor has taken over winemaking duties. The cellars in the town of Eger (right) are carved into volcanic tufa below a row of small wine cellars which once belonged to individual houses, but each of which Tibor Gál has bought out gradually, so now they have a one kilometre-long cellar containing almost 8,000 bottles as well as good visitor facilities. 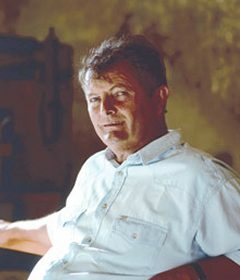 Tibor Gál use both very modern, reductive techniques and older, more oxidative techniques, for different wine styles. They are also making something of a specialism of Pinot Noir with Reserve and Single-Vineyard wines, and were the first Hungarian winery to plant Viognier. 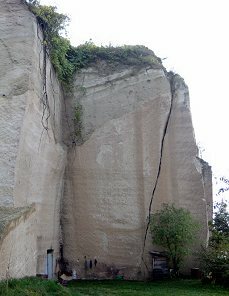 Another cellar hollowed into the tufa rock, around 12 kilometres from Eger. This is another operation that employs a combination of an all-stainless steel “technological cellar” for whites and old, very traditional cellar with Hungarian oak vats and barrels for reds. The Thummerer family estate is led by Vilmos Thummerer (left), a first generation winemaker now with 84 hectares of vineyard, and growing over 20 varieties, both international and Hungarian. This is another big concern by Hungarian standards, with around 25 different releases and a half million bottle production. In fact the Thummerer cellars are well over 100 years old, and in their chequered history once belonged to an aristocratic Hungarian family. They remained in the hands of a Hungarian count until 1949, when they were taken over by the state to become a cooperative cellar. Finally, the Thummerers took the cellars back into private hands in the 1980s. The cellars also house a fabulous restaurant, open only to group parties, where a succession of fantastic, authentic peasant dishes are prepared in two large, wood-fired ovens. I caught up very briefly with winemaker Vincze Béla in a wine store in down-town Eger, where he arranged to meet my little party and show us a couple of his wines. 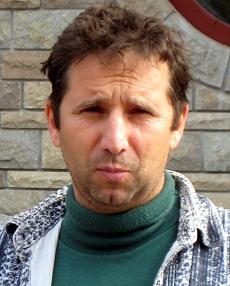 Vincze was Winemaker of the Year in Hungary in 2005, and has carved out something of a reputation for his Bordeaux variety wines in particular. When we met in late September, he told me he had just started harvesting his Pinot Noir, but that a period of heavy rain just before I arrived was potentially a problem – rain is unusual for the Eger region at harvest time. Again, these are more ‘international’ styled wines, but quality is undoubtedly very high.